↑ Briar Branch Detention Basin. 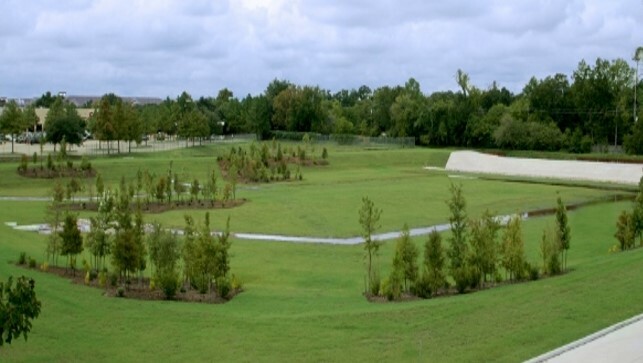 Completed in 2014 and provides 44 acre-feet of storm water detention capacity. 89% of the basin volume is dedicated towards community flood damage reduction. Please see "Projects" tab for more details. TIRZ 17 Redevelopment Authority (also known as Memorial City Redevelopment Authority) is a local government corporation created to aid, assist and act on behalf of the City of Houston in promoting the common good and general welfare in the Memorial City area of Houston. Specifically, the Authority is responsible for operating and administering TIRZ 17 and implementing the TIRZ 17 Project Plan. The Authority is the operating and financing vehicle for TIRZ 17. The Authority is governed by a board of directors appointed by the City of Houston. TIRZ 17 (Reinvestment Zone Number Seventeen, City of Houston, Texas) is a tax increment reinvestment zone designated by the City of Houston. The goal of TIRZ 17 is to promote the development and redevelopment of the Memorial City area of Houston by investing in public infrastructure, particularly road and drainage infrastructure. TIRZ 17 encompasses approximately 1,000 acres of land within one of Houston’s major activity centers. Retail, office and health care uses are prominent in this dynamic and actively growing area of Houston. The Memorial Management District (Harris County Municipal Management District No. 1, dba the Memorial Management District) is municipal management district providing supplemental services and improvements to property owners within its boundaries. Many, but not all, properties within TIRZ 17 are also within the Memorial Managemen District. Due to common interests, there are opportunities for the District and the Authority to work together in implementing and maintaining projects. THE CONTENT CONTAINED IN THIS WEBSITE IS PROVIDED BY THE MEMORIAL CITY REDEVELOPMENT AUTHORITY (DBA TIRZ 17 DEVELOPMENT AUTHORITY) (THE “AUTHORITY”) AS A PUBLIC SERVICE. THIS WEBSITE AND THE INFORMATION CONTAINED HEREIN SHOULD NOT BE RELIED UPON OR USED AS INFORMATION FOR THE PURPOSES OF SECURITIES DISCLOSURE ABOUT THE AUTHORITY OR ITS FINANCIAL CONDITION. PERSONS SHOULD NOT RELY UPON THIS INFORMATION WHEN CONSIDERING WHETHER TO BUY, SELL, OR HOLD BONDS, NOTES OR OTHER OBLIGATIONS ISSUED BY THE AUTHORITY. ALL INFORMATION CONTAINED HEREIN SPEAKS ONLY AS OF THE DATE INDICATED. THE AUTHORITY ASSUMES NO DUTY TO UPDATE ANY INFORMATION CONTAINED HEREIN.